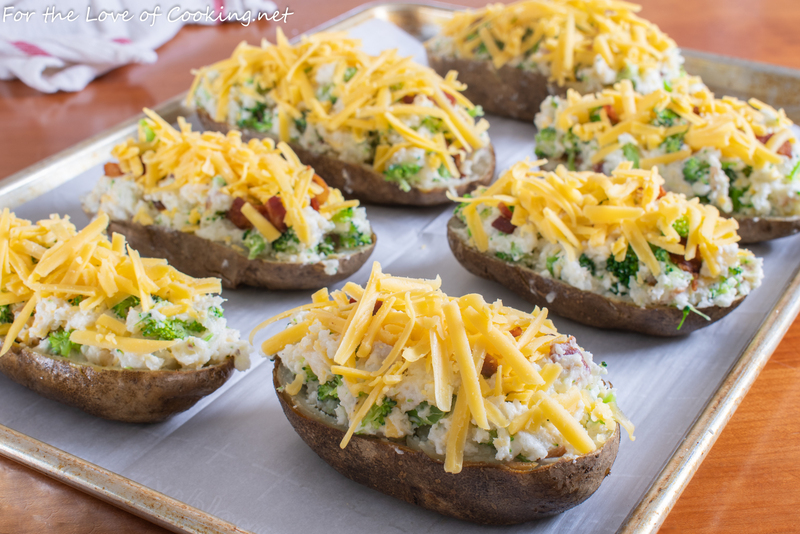 We are huge twice baked potato lovers in my family and I make them often. I tried switching it up recently by making them stuffed with steamed broccoli, extra sharp cheddar, and bacon crumbles. My family was divided on this recipe – my daughter and I thought they were really tasty while my husband and son thought they would be better without the broccoli. Silly boys!!! I had a leftover one today and it was a delicious lunch. 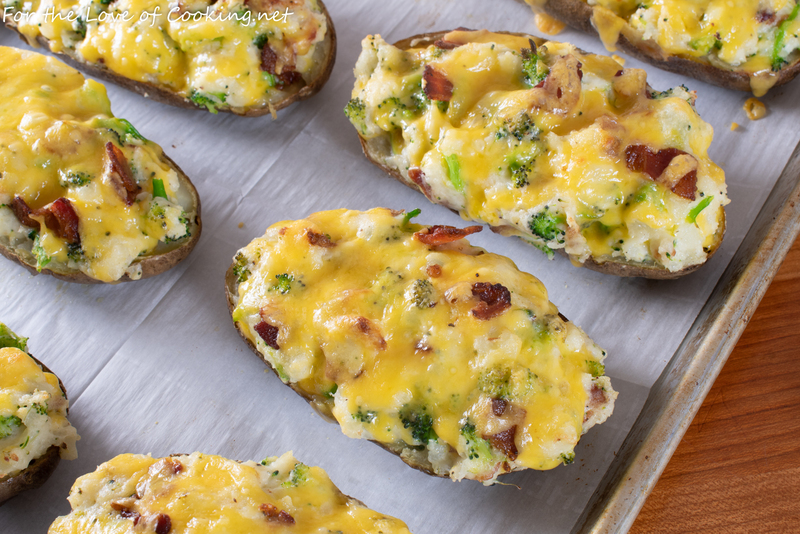 I guess I’ll be making these broccoli cheddar twice baked potatoes with bacon when it’s just me and my daughter home for dinner. Wash the potatoes then poke a few holes with a fork or knife. Place into the oven and bake for 60 minutes, or until fork tender and cooked through. Remove from the oven and let them cool but don’t turn off the oven. While the potatoes are baking, cook the bacon pieces in a skillet over medium heat until cooked through and crisp, about 5-7 minutes. Remove from the skillet and place the crumbles on a paper towel lined plate to soak up the grease. Set aside. While the potatoes are baking, steam the broccoli for 7 minutes then drain and rinse with ice water to stop the cooking process and to preserve the bright green color. Set aside to cool. Chop into smaller bits. When potatoes are done cooking, allow to cool for about 10 minutes. 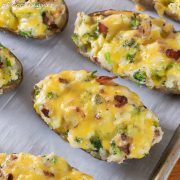 Slice potatoes in half lengthwise and gently scoop out the flesh into a mixing bowl and mash well with a hand masher until well smashed; set the empty potatoes halves on a baking sheet. Brush a bit of olive oil on the outside of the potato skin if desired. Add 3/4 cup of the cheese, sour cream, bacon crumbles, butter, sea salt and freshly cracked pepper, to taste. Mix thoroughly. Add the broccoli pieces and stir until well combined. Divide the potato mixture evenly between all 8 of the potato skin halves or discard a 1-2 of the halves and make 6 or 7 heaping potato halves. Sprinkle the tops of each potato equally with the remaining cheese. Place into the oven and bake for 20-25 minutes. Serve immediately. Enjoy. While the potatoes are baking, cook the bacon pieces in a skillet over medium heat until cooked through and crisp, about 5-7 minutes. Remove from the skillet and place the crumbles on a paper towel lined plate to soak up the grease. Set aside. When potatoes are done cooking, allow to cool for about 10 minutes. Slice potatoes in half lengthwise and gently scoop out the flesh into a mixing bowl and mash well with a hand masher until well smashed. Allow to cool. 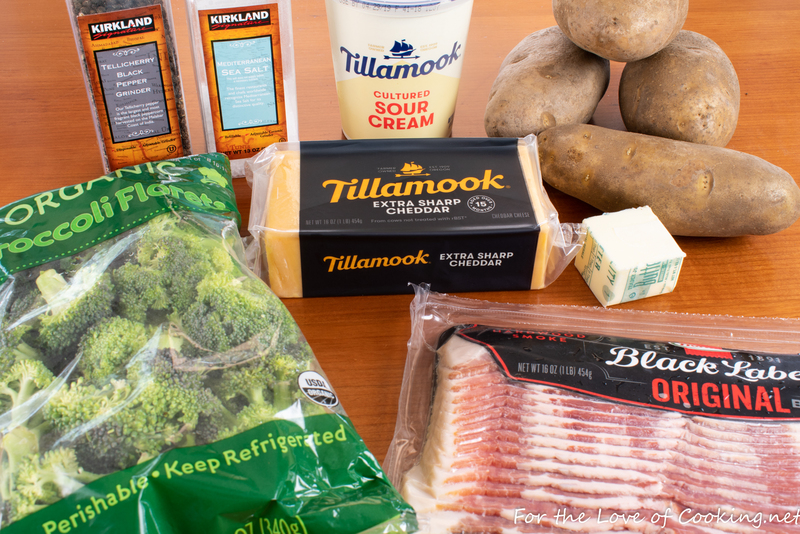 Add 3/4 cup of the cheese, sour cream, bacon crumbles, butter, sea salt and freshly cracked pepper, to taste to the cooled mashed potato mixture. Mix thoroughly. Add the broccoli pieces and stir until well combined. Divide the potato mixture evenly between all 8 of the potato skin halves or discard a 1-2 of the halves and make 6 or 7 heaping potato halves. Sprinkle the tops of each potato equally with the remaining cheese. Oh my – how divine. 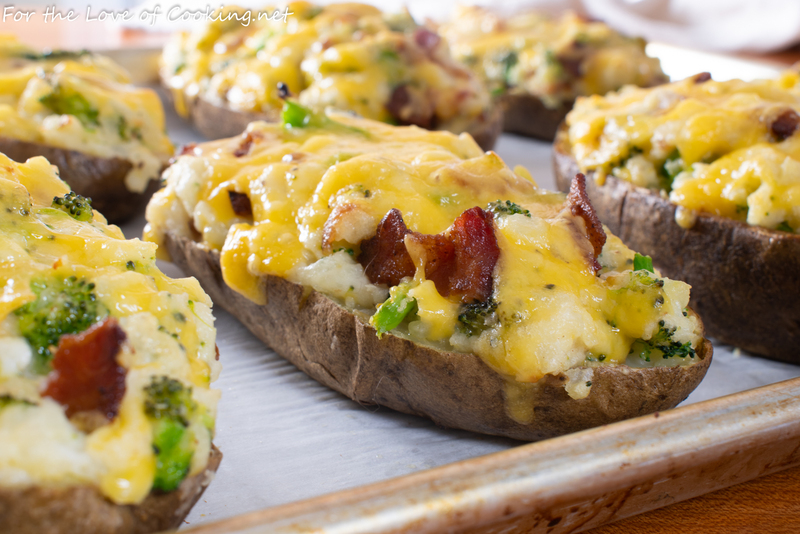 The stuffed potatoes look sp appetizing. Nah – make the boys eat their broccoli. These look wonderful; they’re my kind of potatoes. I love this recipe with potato and broccoli: I printed !! What is it about guys and veggies. I for one would certainly enjoy your potatoes.